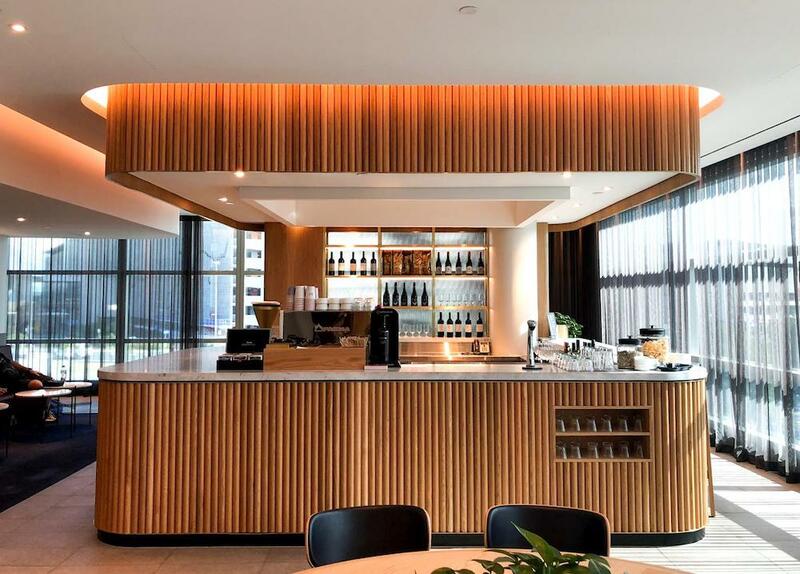 The renovated Brisbane Domestic Business Lounge is styled like its sibling in Perth, with elegant wooden tones and a focus on a certain cuisine. In Perth, that was pizza; here, it is spicy Mexican food, which may or may not appeal to your tastes. 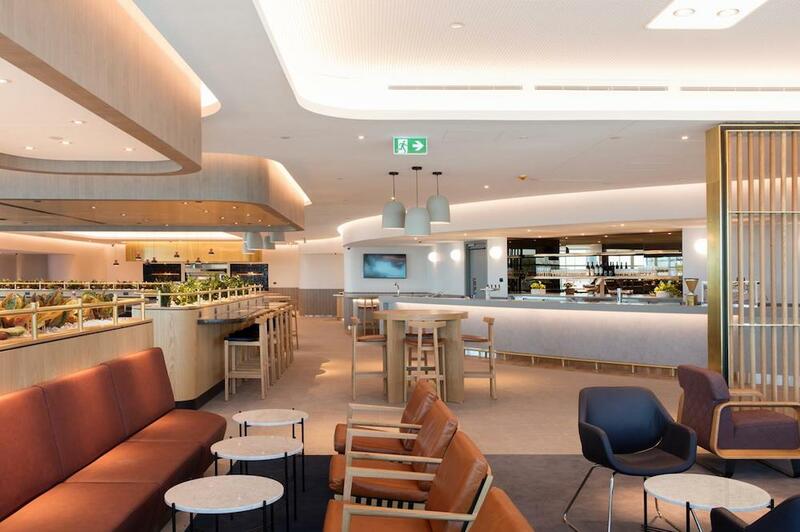 With the Premium Lounge Entry offering a seamless entry into this lounge, lots of seating for a quiet atmosphere, and plenty of food and drink, there is a lot to like with what Qantas have done with the space. 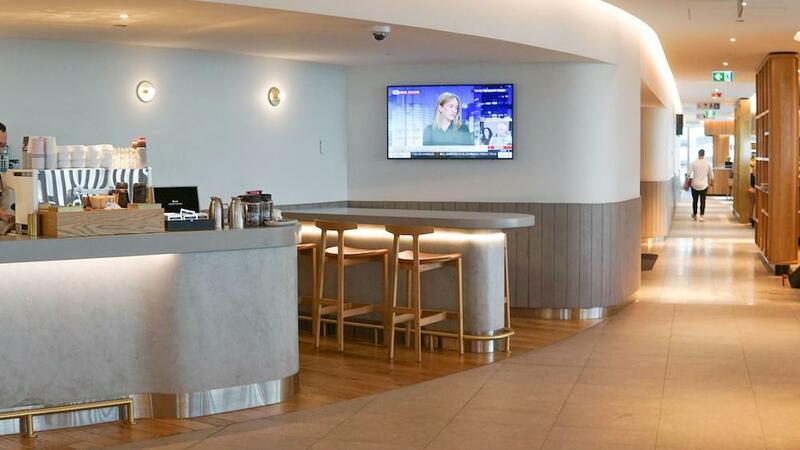 If arriving at Brisbane Domestic Terminal from outside, the easiest way to the lounges is through the Premium Lounge Entry, which can be used by passengers eligible for access to the Qantas Club, Domestic Business Lounge or Chairman’s Lounge. 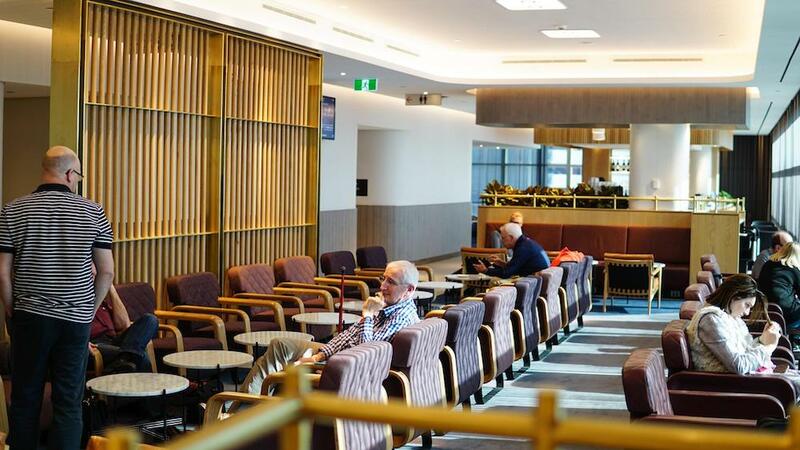 Once you have your boarding passes, your eligibility to enter the lounges will be checked by staff. Next up is security screening in a dedicated lane, and once cleared, you are officially in the Premium Lounge Precinct. 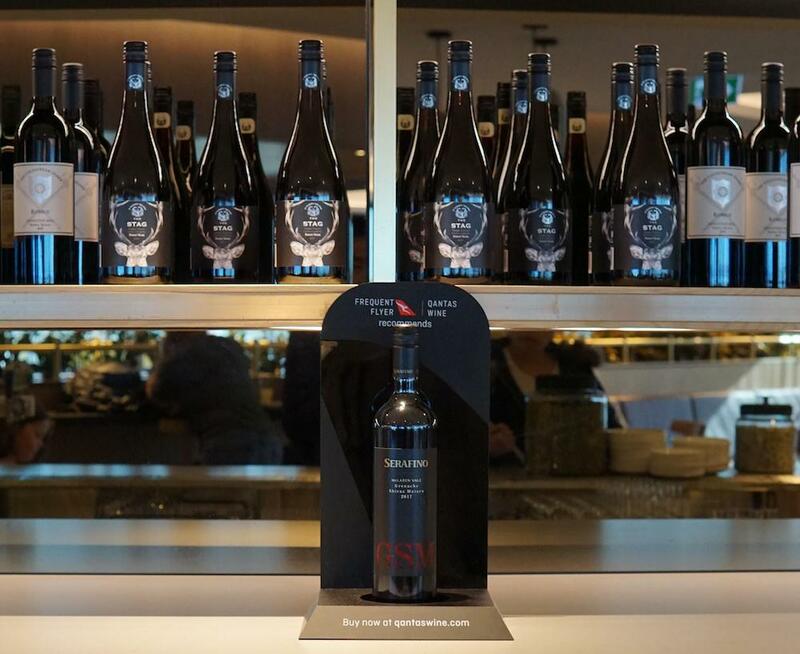 An escalator or lift will whisk you up one level, to the main foyer of the Qantas Club. 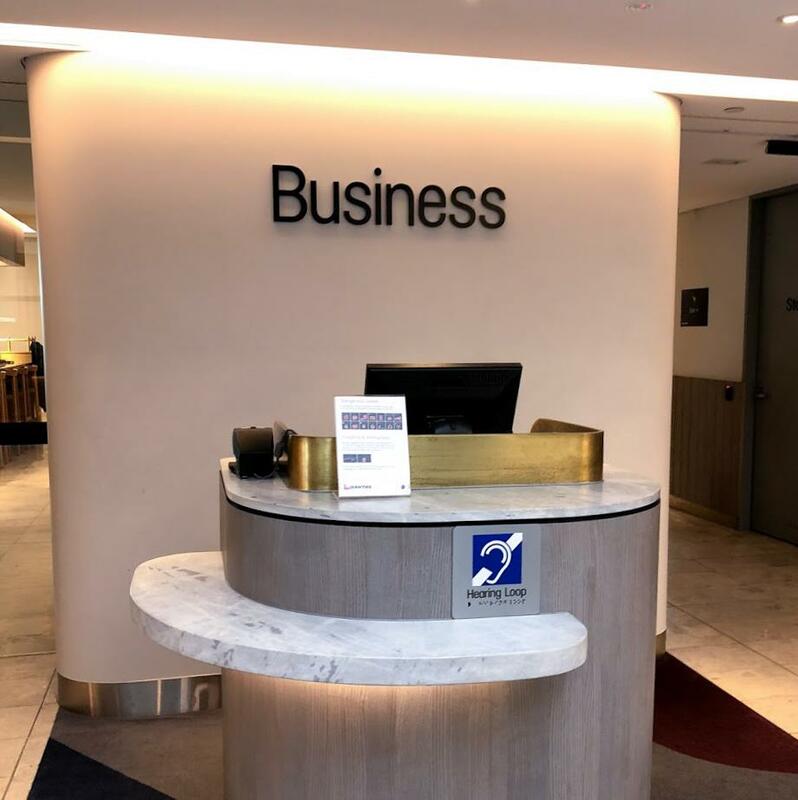 You will find the entrance to the Domestic Business Lounge immediately on your left. Opposite that entrance is a coffee station open during the morning rush. 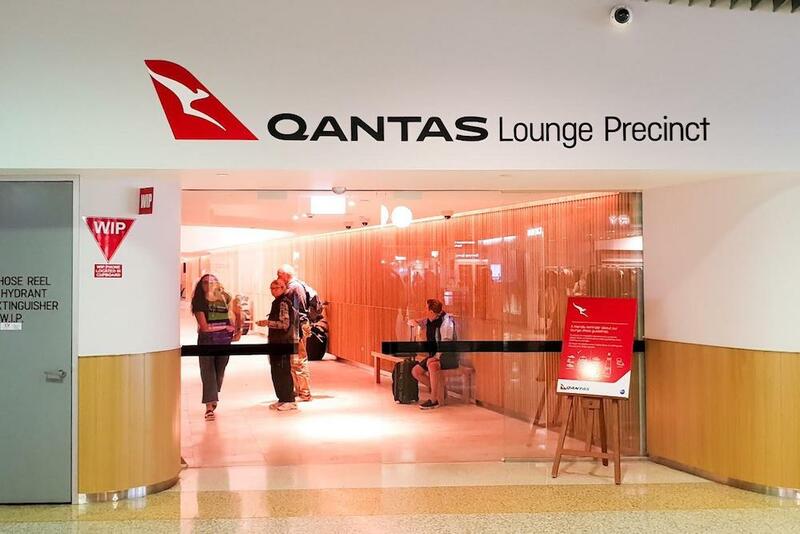 If you are already in the terminal, then you can access the lounge precinct through the clearly marked entrance. Your boarding pass will be checked before you go in. 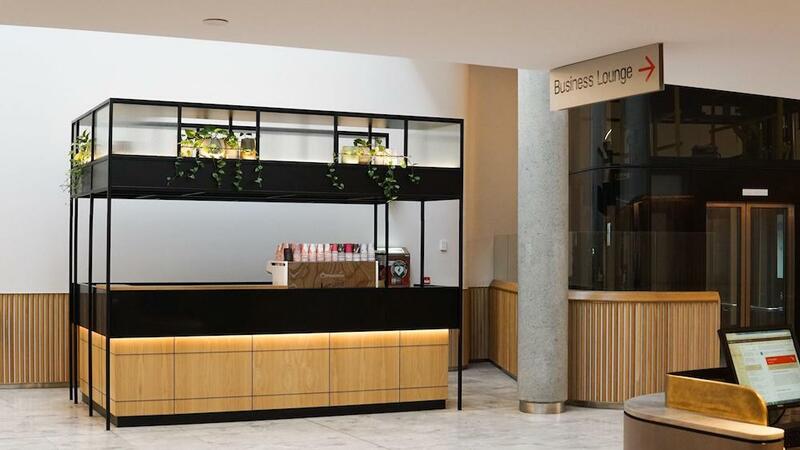 The Qantas Club will be immediately on your left, but if you walk forward past the service desks, you will find the entrance to the Domestic Business Lounge. 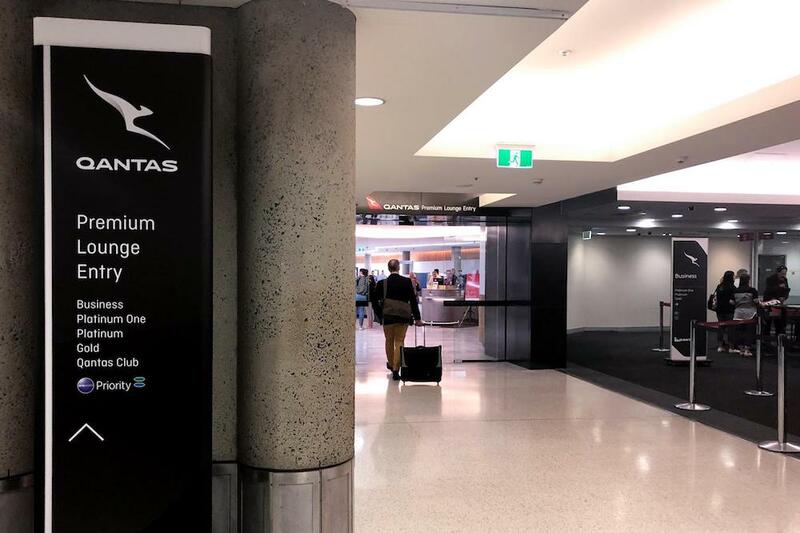 The opening hours are one hour prior to the first Qantas-operated service of the day until the last Qantas departure, seven days a week. 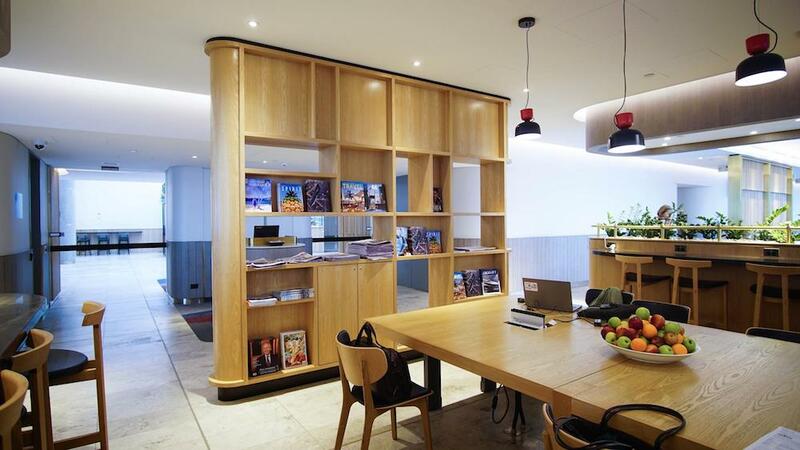 The first thing you will see walking in is the striking magazine display. The working desks here feature a solitary computer, if you do not have your own device to work on. Walking to the left from the entrance, you will find this to be the quieter part of the lounge. Seats are arranged in pairs or facing the windows. There is plenty of natural light but no tarmac views from this edge. 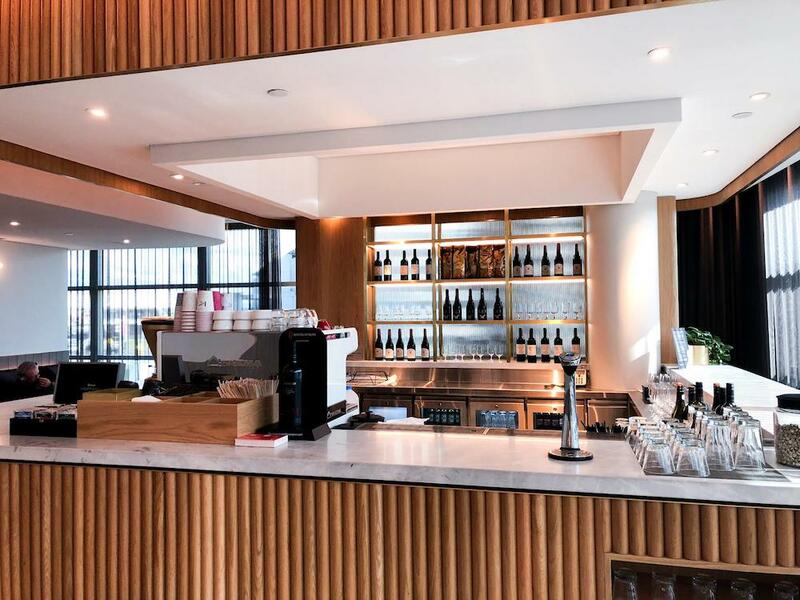 Further down is a secondary wine and coffee bar, which has much less foot traffic than the main bar. 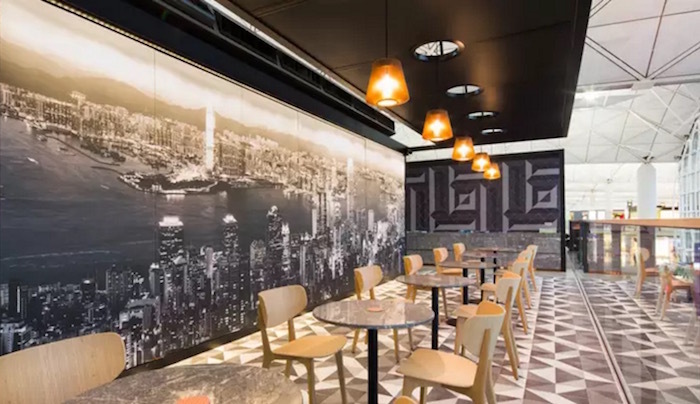 This is the best area to perch yourself if you need some peace and quiet, as there is some additional seating behind the bar that is not often utilised. 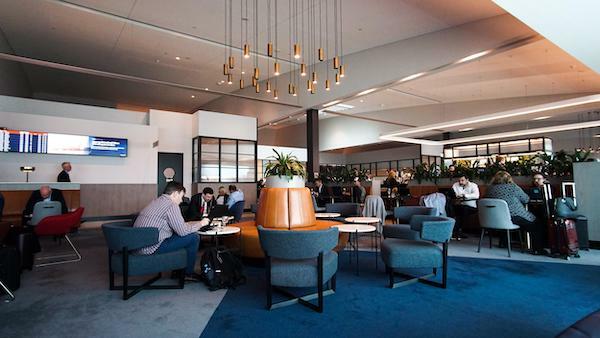 Heading back into the belly of the lounge, you will find the main bar first, flanked by a plethora of seating options from solo benches, communal tables and the usual pairs of chairs. Social interaction and collaboration is high on the cards in this area. The main barista coffee station is located here. 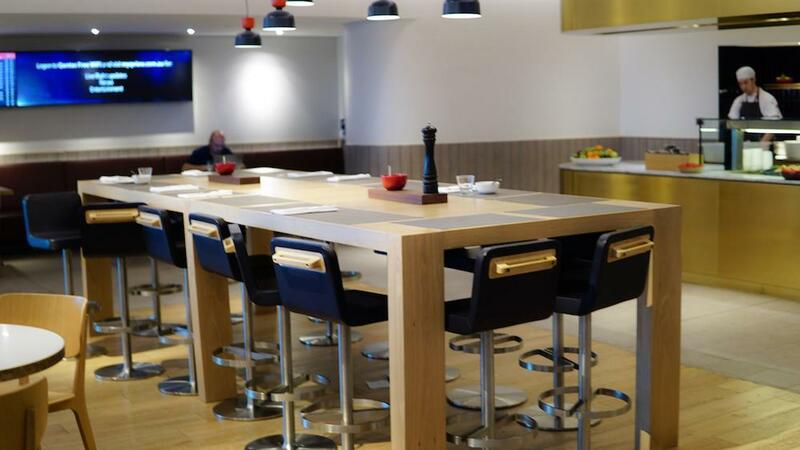 The bar is surrounded by high tables of different shapes and sizes to wine and dine at. 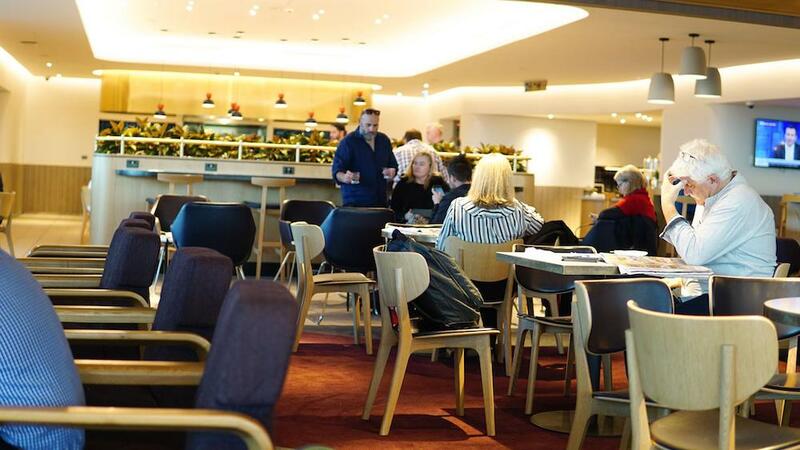 The main lounge area around the bar is usually the first to fill up during busy periods. 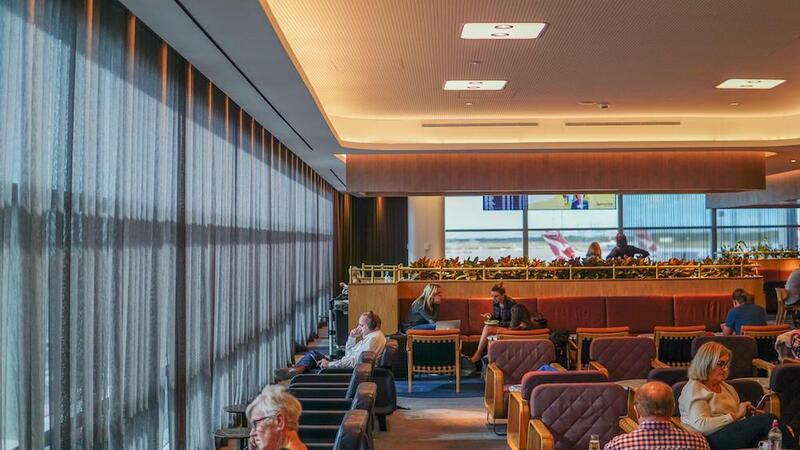 Those wanting some more privacy can head to the windows, which look out onto the tarmac where QantasLink turboprop planes can often be spotted. The final area to explore is the dining zone, and this is found just beyond the bar. 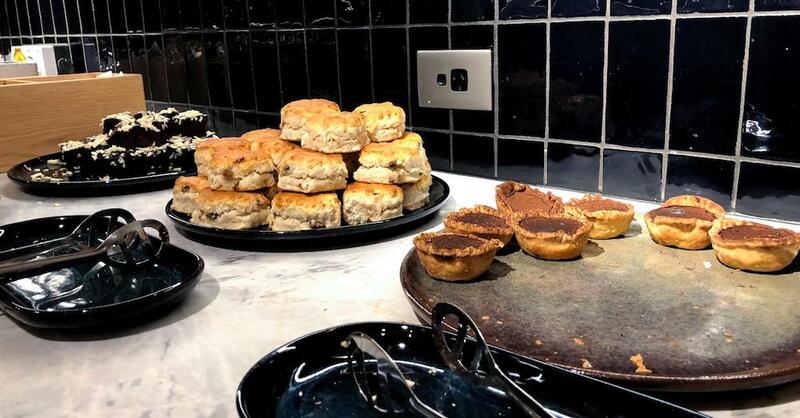 The breakfast ‘Plate of the Day’ can be found here during the mornings, otherwise, it is just ordinary seating close to the buffet. 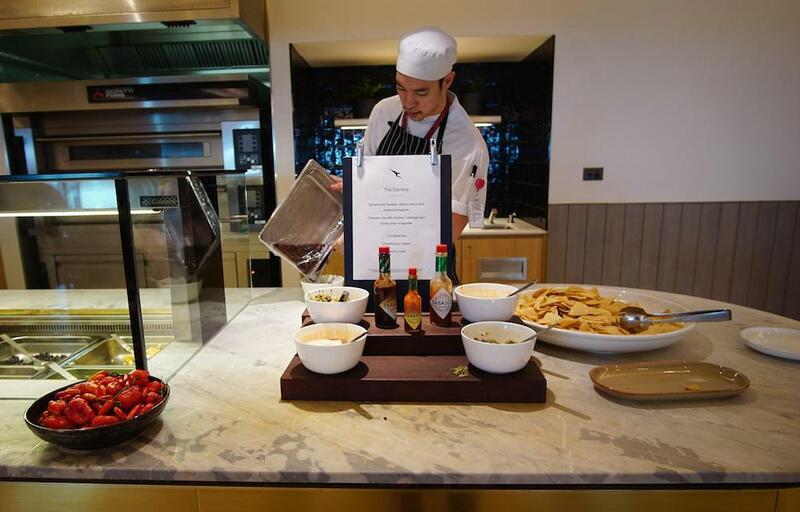 The standout feature in this area is the Cantina, which offers Mexican-style dining to complement the standard food buffet. The menus are rotated every few weeks. 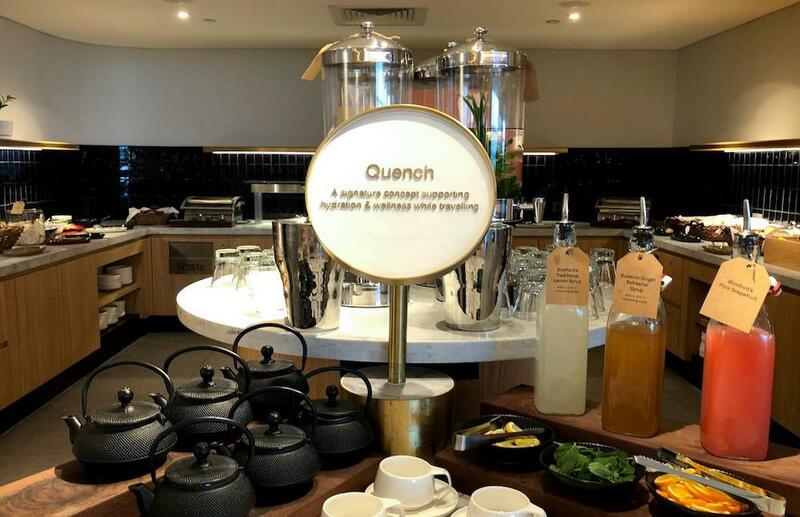 Otherwise, the standard buffet area is located adjacent to the cantina inside a small nook, with the eye-catching ‘Quench’ station in front. It can get a little crowded in here as everyone is boxed in when trying to get food. 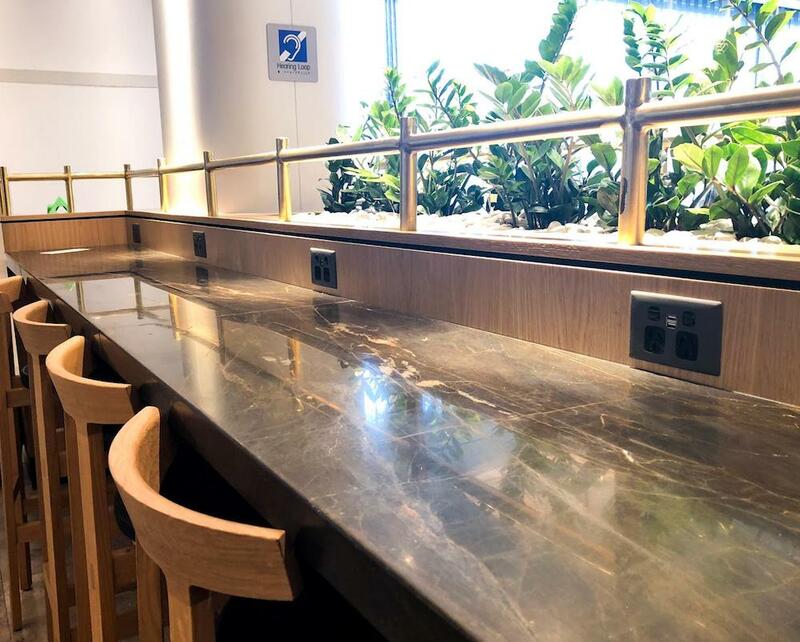 Power ports are located in most seating locations. 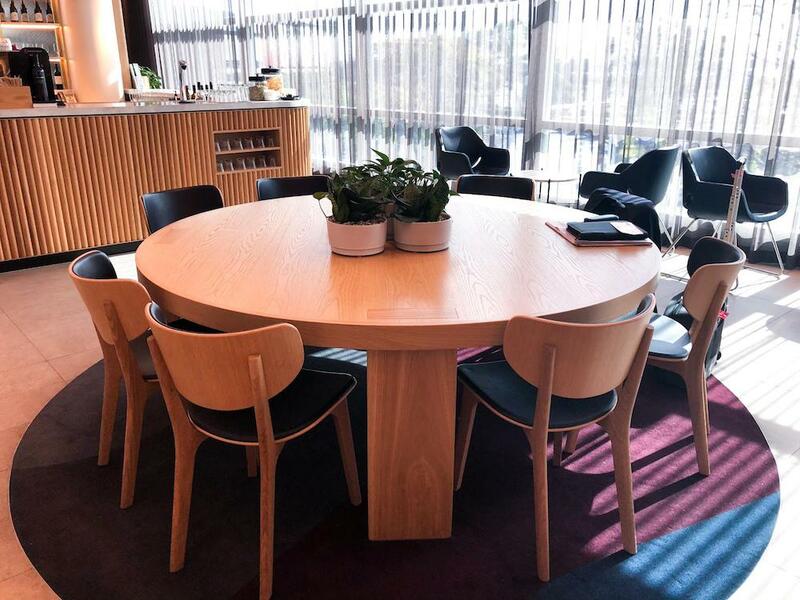 Long benches have them in the middle, high benches will have them at table height, and other configurations will see them along the walls, usually under the tables or chairs. 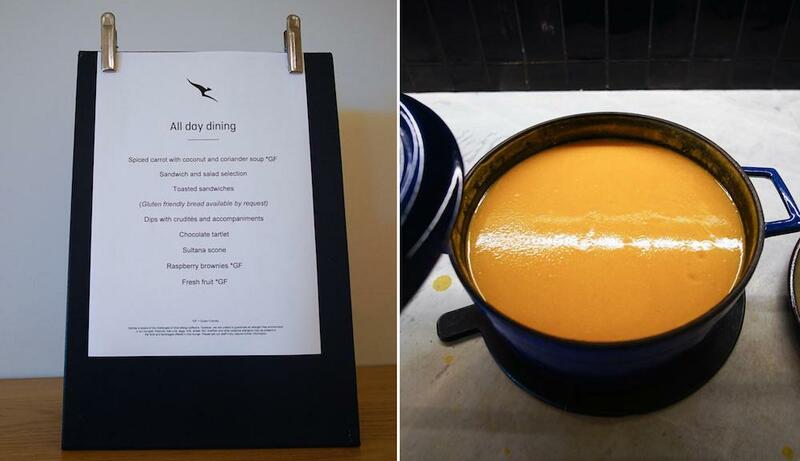 An ‘all day menu’ was up during the visit, with the only hot dish being soup but more filling dishes are available during breakfast, lunch and dinner. 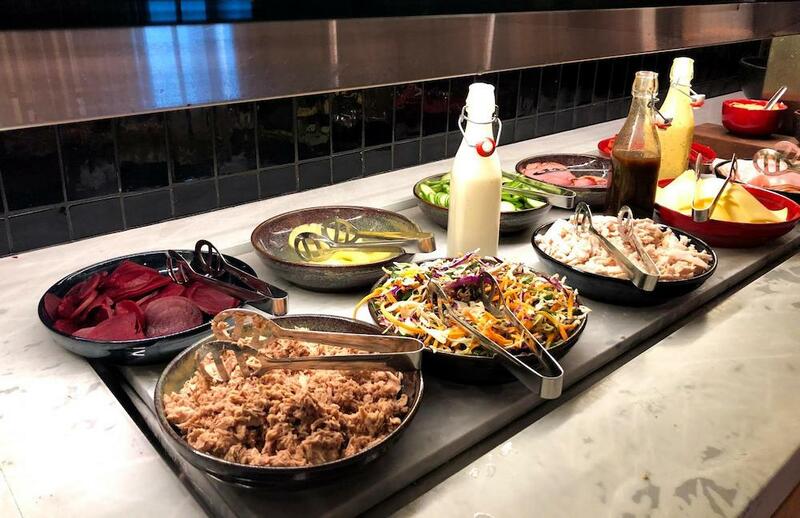 The usual salads, breads and sweet bite selections have a lot more variety compared to the nearby Qantas Club, with shredded chicken and pulled pork making an appearance. The chocolate tart and raspberry brownies were especially naughty yet delightful. 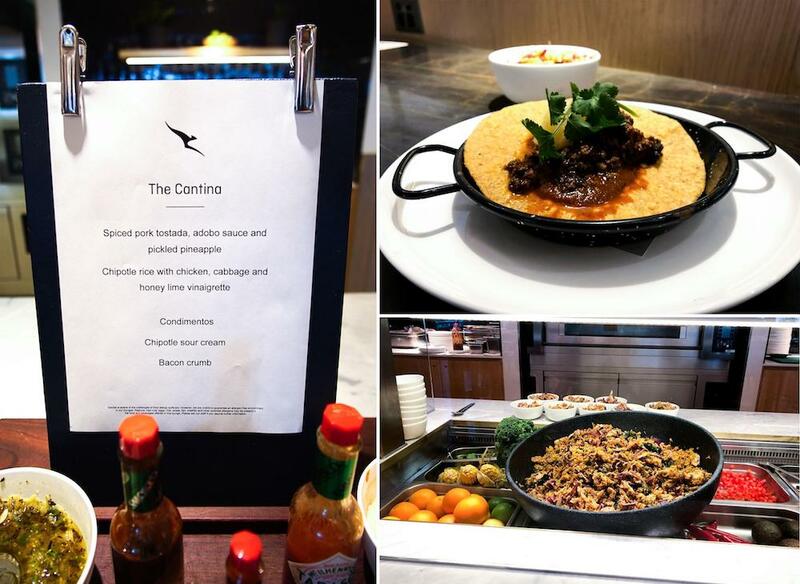 Of course, the stand-out area of the lounge is the cantina, which was plating up two different Mexican dishes. You might want to avoid these if you dislike spiciness, as the chipotle rice was very hot to the palate. The spiced pork tostada was milder and can be customised with your choice of condimentos. 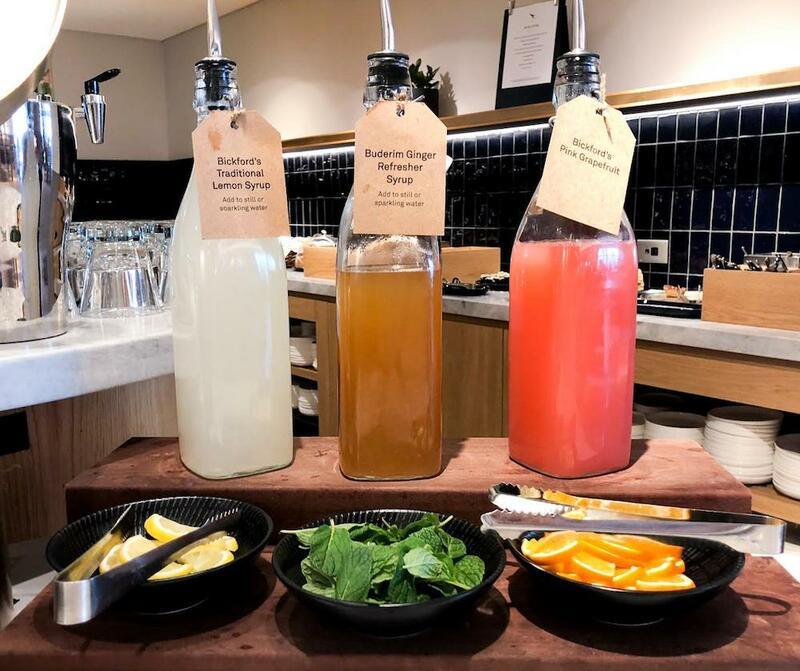 As part of Qantas’ focus on health and wellbeing, the Quench station offers a number of non-alcoholic drinks you can mix yourself. 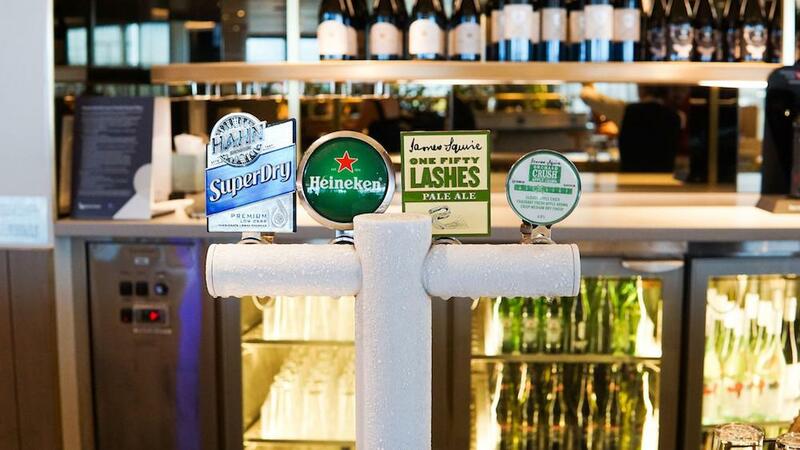 The bar staff are more than happy to pour a beer, cider or spirit or offer you a glass of wine but even if you want a simple soft drink, you will need to ask here as there is no self-service. 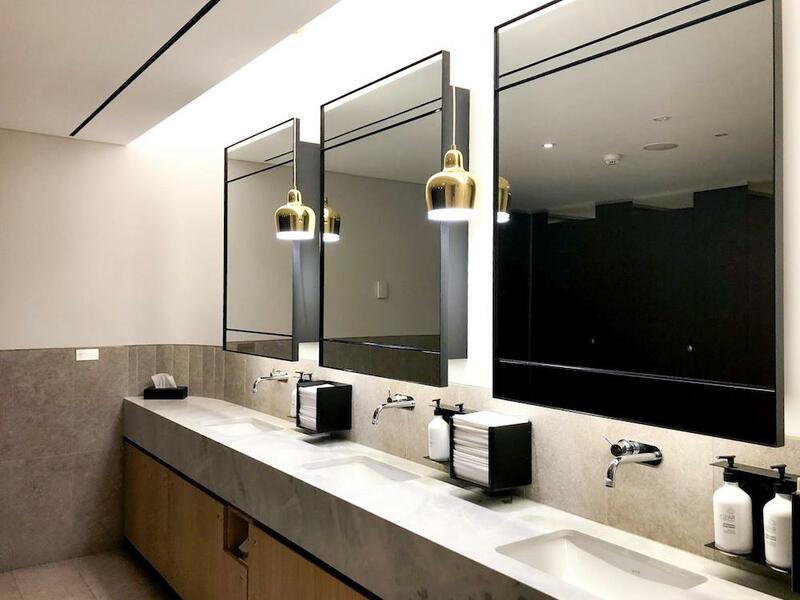 As you would expect, the bathrooms are kitted out with higher-quality products than the Qantas Club. 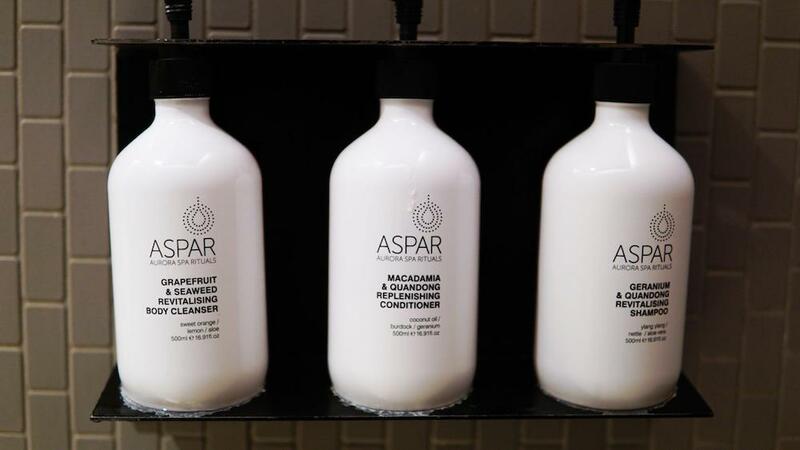 You will find the usual ASPAR-branded soaps and creams, and premium paper towels. The rainfall showers also provide a series of three revitalising products for your body and hair. 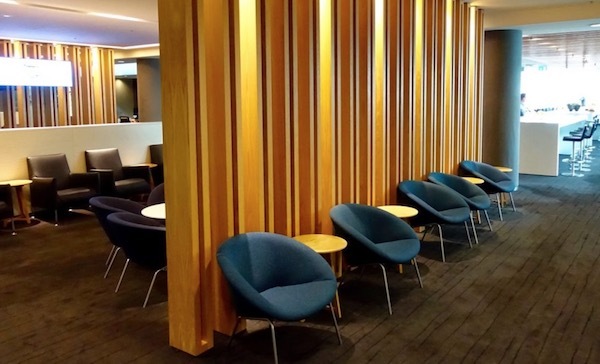 If you have Platinum status or higher, you can access this lounge even when on a domestic Jetstar flight, as they depart from neighbouring gates, a short walk from the lounge. 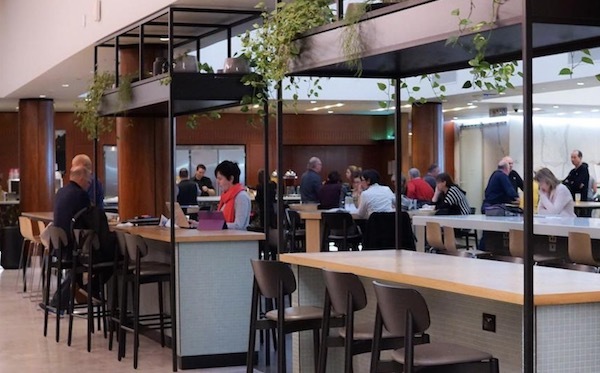 Credit cards,Qantas Club membership and individual day passes are not going to get you into this lounge flying domestically but they may get you into the neighbouring Qantas Club. 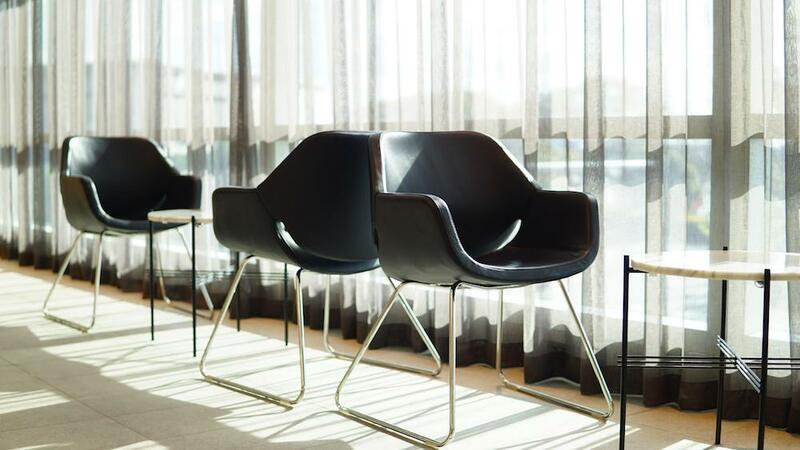 Guests are usually allowed in the lounge (1-2 depending on your benefits) and do not need to be travelling at all. 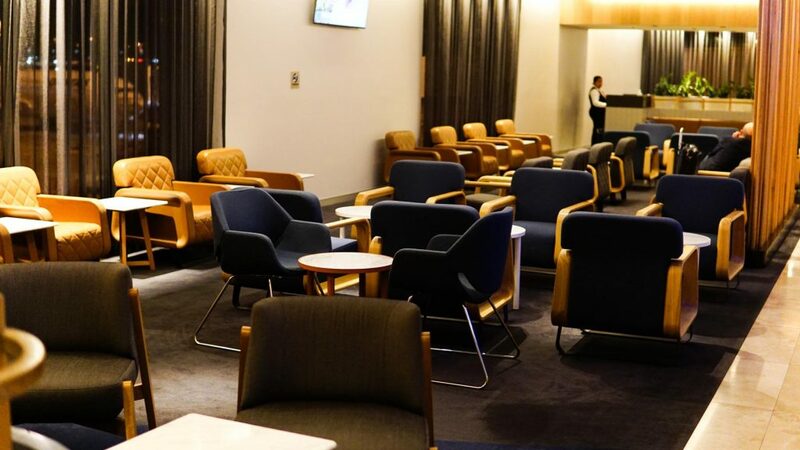 Like the Perth Domestic Business Lounge, the Brisbane lounge rates extremely highly in our book and might just be one of the best in Qantas’ entire portfolio—even compared to some of their ageing International Business Lounges in various cities. 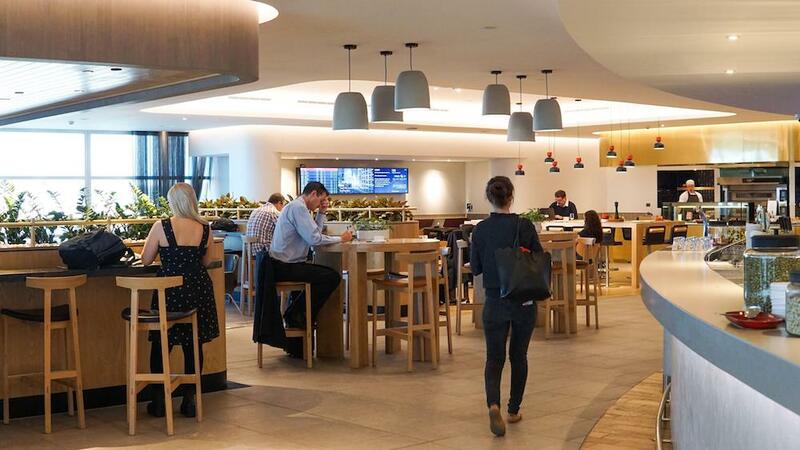 It certainly sets the bar high for their future lounge renovation projects throughout the network. The staff at Brisbane are really quite snobby and look down on people. We had been delayed 36 hours in New Caledonia due to rain shutting our domestic airport – and our shoes were waterlogged, muddy and as they were unable to get dry very smelly. So we purchased $50 thongs in New Caledonia for the trip home. At the entrance to the lounge we were stopped rudely (with one staff woman staring at us constantly over her red glasses). After 3 minutes of her staring at us while we opened our bags to get our shoes I asked her to stop staring at us. She said she wasn’t. I said she was and it was very rude of her. She turned around and called me rude. Anyway let this be a lesson to everyone not to wear casual attire through the Brisbane Qantas Lounge for fear of being ostracised and judged.